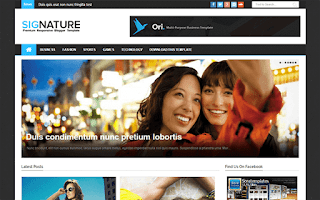 Signature Blogger Template is a complete Blogger theme for a news or magazine site with the focus of attracting and keeping visitors on their site. It uses the best clean SEO practices, and on top of that, it’ s fast, simple, and easy to use. Not only is it responsive but it also keeps that magazine feel right down to mobile screen sizes. Practically every typographic element has been endlessly tweaked for different screen sizes to make sure it looks great no matter what the device. Signature is a blogger template with a awesome functional design that not only looks great but also performs exceptionally too.